All animals (except for insulin-dependent diabetics) should be fasted prior to anesthesia. We recommend taking food away at 8 pm the night before anesthesia. Unless you are told otherwise by one of the doctors, there is no need to restrict water consumption. We request that you bring your pet in between 8 - 8:30 am so that we can begin pre-anesthetic testing and other preparation. This also gives your pet time to settle in prior to his/her procedure. 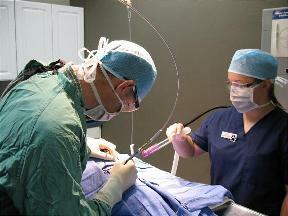 After anesthesia, your pet will be monitored until he/she is fully recovered. Animals wake up from a surgical plane of anesthesia quickly but generally require at least 2 to 3 hours in our facility before they can balance properly. To avoid accidents, such as falling down stairs, we request that your pet stay with us until he/she is no longer groggy. Your pet shouldn't operate heavy machinery for 24 hours after anesthesia. When your pet goes home, there are generally no restrictions on food or water. Encourage but do not force food and water consumption. Most animals will appear unaffected by the anesthesia when they return home but do not be overly concerned if you pet seems more tired than usual. Please call if anything unusual is noted or if you have any further questions about you pet's aftercare.